The most striking feature is the trunk-like pillar of dust and gas protruding from the east side of the nebula towards the open cluster, NGC 6823 in the west. The center of the open cluster, which is about 50 light-years across, is about two million years old and is dominated in brightness by many young, bright blue stars, packed in a Trapezium-formed region of about 1.3 x 0.7 light-years across. 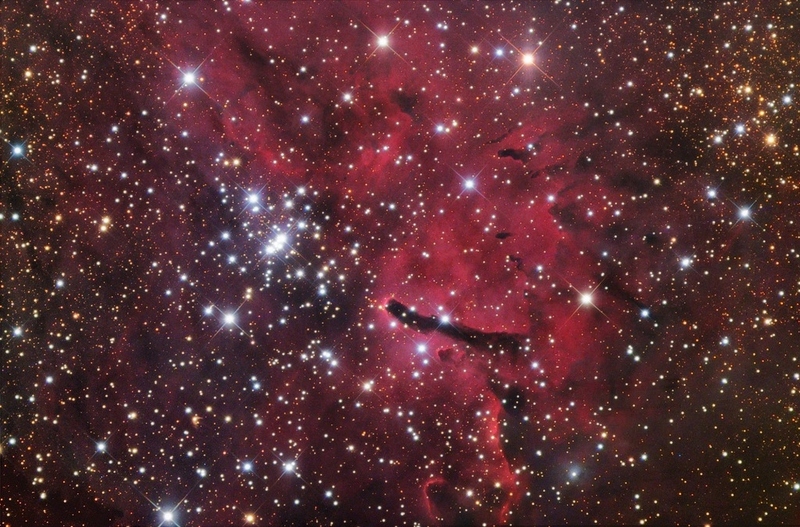 Outer parts of the cluster, involving pillars of the emission nebula, contain even younger stars. The huge pillars of gas and dust are probably formed when surrounding gas and dust is pushed and eroded away by stellar winds and radiation from the brightest cluster stars. Remarkable dark globules of gas and dust (Bok globules) are also visible in the nebula. Bok globules, named after the Dutch astronomer Bart Bok (1906-1983), who proposed their existence in the 1940′s, are dark clouds of dense cosmic dust and gas within star-forming regions in which usually star formation takes place. They most commonly result in the formation of double or multiple star systems. This image is acquired in 2005 at the Nighthawk Observatory. LRGB = 240:60:30:30 minutes.